We are the only advertised Retriever Retreat destination offering a modern, fully furnished, two bedroom retreat facility. The Academy encourages you to become more involved in your companion’s training experience by providing all the amenities of home. Through reservations, clients and guests can enjoy an all day training pass with the dogs followed by a relaxing fire or grilling on the porch. 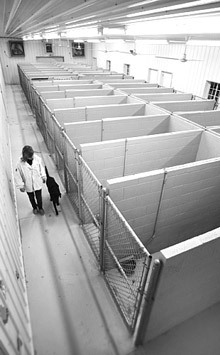 We have been involved in developing a multitude of kennel facilities. From clients to professionals, we have consulted and implemented improved ways of caring for your companion. From the security gate at the property entrance to the kennel’s interior use of light colors and nonporous surfaces, our facility is fully secured, enclosed and clean. The Academy maintains a pro-active approach towards infectious diseases through required vaccines, preventive care, vermin control as well as routine sanitization of kennels, airing yards and transportation vehicles. We use a flushing system for all waste rather than the conventional gutter system. Our kennel includes automatic waters, elevated beds, painted cinder block walls, and constant air circulation. 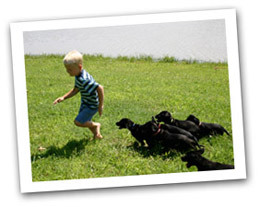 We have four airing yards that are fully secure and allow for grouping or separation of personalities. The Academy’s pro-active environmental approach is equally matched by the support of local veterinarians as well as easy access to Oklahoma State University, School of Veterinary Medicine.